In which Chez Truffula finds room for one, two, three, nope, four more. Especially in the afternoon, our front porch is a major thoroughfare. We've got little people coming and going, and coming, and going. First a friend comes to angle for playmates, then said playmates dash out. They pop back in, first for bikes, then for water because they are thirsty, then for walkie-talkies because they are heading farther afield... It's not a quiet place. No, not at all. On one of the TruffulaBoyz forays back outside, Mr. Truffula noticed a bird, disturbed by the commotion, fluttering away. 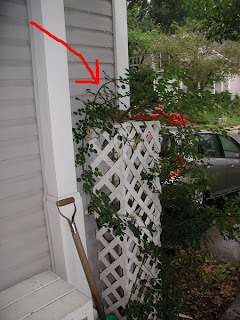 On closer inspection, he saw that the bird, a female robin, had come from on top of the lattice which hides our electric meter, and supports the rose (which blooms so beautifully and fragrantly each Spring). Not only that, but she had some long, dry grass dangling from her beak. That's because she was in the process of building a nest. A nest?! Good heavens! What a location! Cozy, yes. Protected, yes (thorns, anyone?). Secluded, not so much. Frau Robin kept building, and we, now aware of her presence and important task, kept observing. She finished her construction project. We noticed the addition of one egg, perfect in shape and color. And then, there was another, just like it. The next day, the two eggs were joined by a third, and incubation began in earnest. We watched her sit, tucked into her nest, patiently warming the eggs beneath her. She flew off at every human arrival and departure, of which there were many. We tried to slip quickly and quietly past her, so as to disturb as minimally as possible, to little avail. Sometimes, we used an alternate door; those were, of course, the times when young friends trotted up to the front door nevertheless. Over the course of the passing days, Frau Robin grew on us, as we became increasingly mindful of her vigilant presence. And, apparently, we grew on her. Sudden movements continued to startle her, but we began to be able to walk past her without her flying away. Maybe she knew how much we were rooting for her, hoping that all of her eggs would hatch out successfully, unhampered by two- or four-legged disturbances. Two weeks later, we spied two eggs... and a newly minted hatchling, so small, delicate, and vulnerable in appearance. Over the next day, the other two birdies hatched out, too. Whew! Another milestone reached! Frau Robin's mission changed dramatically. She stopped sitting, and started gathering food for her babies. Lots of it. We now saw her out and about in the yard, looking for goodies to bring back. I thought selfishly of my ripening blackberries, but under the circumstances of hungry mouths to feed, I put on a more generous attitude. The nestlings didn't discriminate. In their minds, anything hovering near the nest = FOOD DELIVERY. That included us, as we respectfully came to visit. 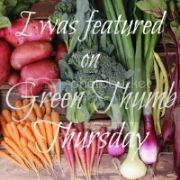 Their necks started craning, and we could hear their beaks clapping as they opened and closed their mouths in anticipation of tasty morsels. One evening, we all sat just inside the open front door, waiting to catch sight of a feeding session. As we waited, one son was engrossed in his Harry Potter book. The other demonstrated exactly how much energy bubbles out of a 5-year-old, especially when trying to sit still in anticipation. Our patience was rewarded, to our delight, and that of the babies, who welcomed their mama with eager peeps. And then, they were gone. All four of them. Just as suddenly as Frau Robin had entered our lives, she and her new family parted ways with us. I miss them. During the month they were there, checking on the bird and its eggs became a habit. What a privilege to have such a front-row seat for this miraculous process! The now-empty nest remains sitting on top of the trellis, and none of us have sighted our guests since they left the nest. I can hear the many birds in the yard, and like to think that "our" feathered friends are among them. Frau Robin, I'll leave a blackberry on the vine for you! Very cool. 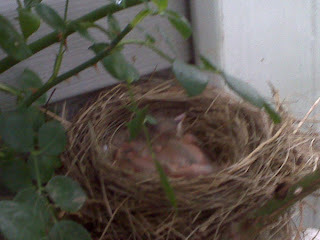 We had a robin family in our orange tree back when my youngest was a baby. We never actually saw the nest (until they abandoned it) but we did watch the mommy and daddy robins frantically delivering food back and forth. It was right outside our family room window so we were also able to watch the babies on their first forays out of the nest. What magic it is - for adults as well as kids. Aww, they're so cute! How lucky for you and your family. Wow! What a great treat for you and your family. Thanks for sharing, especially the cute pics! Awww...that was just adorable. How lucky you got to have that experience. Reminds of me being a kid. A robin nested on the eave of my bedroom window every year while I was growing up. 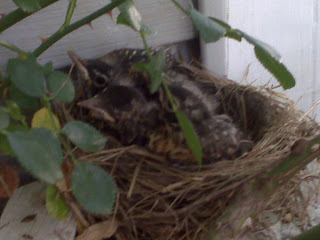 We would always clear away the nest (robins don't reuse) in the winter, and she'd come back every spring. We had a cardinal family outside our front window. Fascinating! it's wonderful to be able to watch nature in action. Thanks for sharing your own encounters with robins. @girlreader - Ah, so they don't reuse! Good to know. I wonder whether we'll have a repeat in the same location next year... stay tuned! @Daisy - when my siblings and I were growing up, we had cardinals frequent the patio outside of our living room. Your comment reminded me of how we used to watch them from behind the mirrored glass (it had a film on it to help keep the room cooler - so, we could see out, but the cardinals couldn't see us). wow, how sweet. Thank you for sharing.